Brown has earned some serious writing credentials. Her fiction, articles, and essays have appeared in numerous publications, and she was the winner of the 2005 World's Best Short-Short Story Contest (judged by Robert Olen Butler) in the Southeast Review. 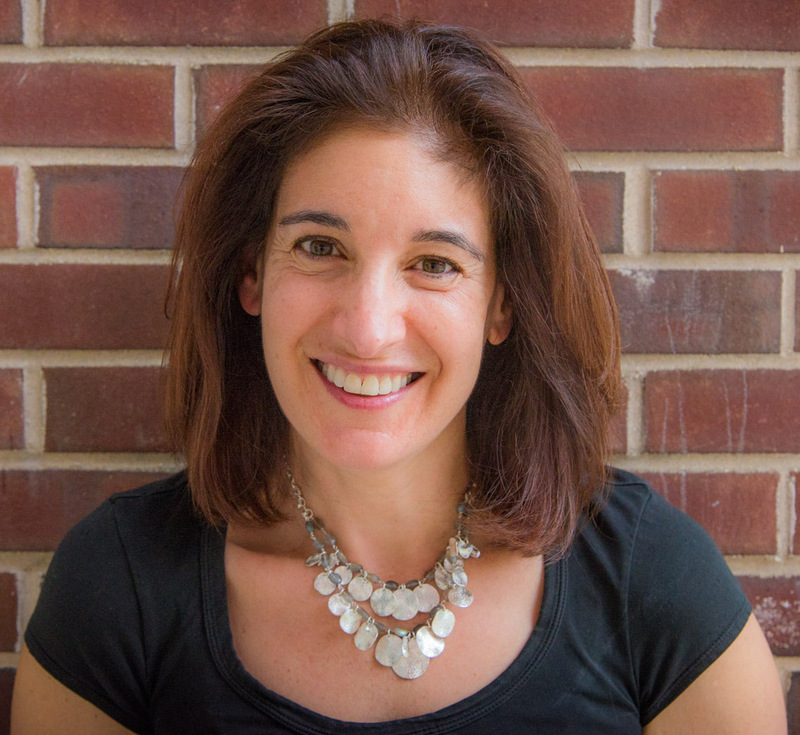 Her creative nonfiction piece, "The Codeine of Jordan," published in the Bellevue Literary Review, was selected as a notable essay in 2012's The Best American Travel Writing and included in volume 9 of The Best Women's Travel Writing. 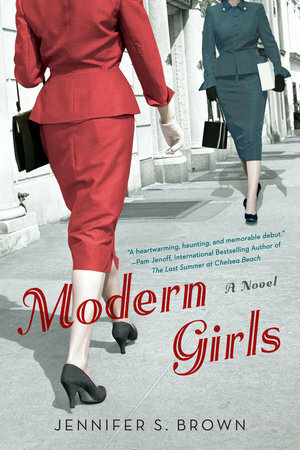 Modern Girls, set in 1935 in the Lower East Side of New York, is about a Russian-born Jewish mother and her American-born unmarried daughter. Each discovers that she is expecting, although the pregnancies are unplanned and unwanted, in this story about women's roles, standards, and choices, set against the backdrop of the impending war. Before meeting Brown this week, I fired off some questions that she was good enough to answer despite her busy book launch schedule. First of all, congratulations on the publication of Modern Girls! This is a novel after my own heart: a mother-daughter tale chock full of family secrets. What inspired you to create this particular plot line? Genealogy! I went through a phase of serious family history research, and the mother character, Rose, was based on my own great-grandmother who was, not coincidentally, also named Rose. My father told me that real-life Rose had an unwanted pregnancy during the Great Depression. That led me to wondering what would it be like, in a time of limited choices for women, to be accidentally pregnant. What if a woman were young and unmarried? What if she were older and thought she was done having children? From this grew my characters of Rose and her daughter, Dottie, both of whom become pregnant, which neither wants to be, but for very different reasons. How did you go about researching a story set in 1930s New York City? Of course I also had to move beyond books. To do that, I visited the Tenement Museum in New York City to see how Rose would have lived when she first came to America. I bought magazines on eBay from the 1930s that Dottie would have read. For an entire day, I sat in the New York Public Library reading Socialist newspapers to understand Rose's worldview and scouring transit maps to make sure Dottie knew how to traverse New York City. My favorite form of research, though, was watching movies filmed in the 1930s; nothing beats Clare Luce Booth's The Women for the slang and dialogue of the day (and for a fabulous story--if you haven't seen the original film, you must do so immediately). *Oh, okay, I'll tell you: Kotex pads were originally made from woodpulp fiber (called Cellucotton) that was used in bandages in World War I. When the war ended, there was a surplus of the material, so it was cleverly made into sanitary napkins. Now please don't use this against me in a trivia bee. I'm always curious about historical novels and how authors create fictional worlds that are realistic, based on the time the book is set, without weighing the reader down with cement blocks of research. Any special tips for writers who are struggling to research and write historical fiction? Learning to let go is important. It's tempting to want to use every single fact you discover. It's all so interesting to the author, but to the reader it can end up feeling like the author is merely showing off her knowledge. I found it easiest to put in too much in the first draft and then to go through and edit. I have pages and pages of descriptions of theater shows, sporting events, and social news that were never used. The fun part of this is that I feel like I have secrets about characters and places in the novel. For instance, Rose's youngest son is named Eugene. It's never mentioned in the book, but Rose named him after Eugene Debs, who ran for president five times as a candidate of the Socialist Party. Of course there's the opposite problem too, where the writer can get stuck trying to find a fact and it holds up the writing. When I found myself halted because I wanted to know the name of a store on the south end of Union Square or who was lecturing at Cooper Union, I'd force myself to let it go so I could continue writing. It's too easy to lose hours to research. In those cases, I'd write in the draft "[input name of cafe on Lower East Side]" and plow on with the writing. When the draft was done, I could take more time to research and fill in the missing facts. You and I are lucky enough to be with a major publishing house, Penguin Random House, where we even share the same editor. What was the process of working with an editor like for you as a debut novelist? Was it a lot different, say, from sharing your manuscript with a critique group or writer friends? My writing group is absolutely fabulous and because of their advice and critiques, my manuscript was strong enough to be sold to NAL/Penguin. However, working with my amazing editor (excuse me, our amazing editor! ), Tracy Bernstein, took the novel to an entirely new level. I was so afraid that working with an editor would lead my book in a different direction, but instead, every time she made a suggestion, it drew out a new layer of the story. She motivated me and brought out the best in my writing. I was eager to revise under her tutelage. You've bounced all over the country, living in places as diverse as Miami, New York City, Seattle, and now Boston. What made you choose New York City as your setting? And how did living in all of these different places inform your perspective on New York? Despite having lived all over, if you ask me where I'm from, I'll say I'm a Floridian. Growing up in Miami Beach was surreal, watching it change from an old-fashioned, backwater town into the vibrant, strange, wonderful city it is today. I feel fortunate to have spent my formative years there. Yet as much as Miami Beach is home, New York is my heart. I can't claim to be a New Yorker, though I was born in East Harlem at a now defunct hospital, went to college at NYU, and spent my young adulthood in the East Village. New York has a vibrancy to it like no other city. But as a young person, it was difficult to make ends meet, and I worked extremely long hours to pay for an illegal apartment that was a complete fire trap. When I moved to Seattle for graduate school, I planned to move back to New York, however something in that Seattle air got to me, and I fell in love with the city. I began biking and hiking and not using an umbrella in the rain. It took my husband's career to lure me back to the East Coast. Boston has its charms (although the sports thing here is a little crazy) and it's where both my kids were born, so I think we're here for the long haul. Boston feels like home. One thing I learned from living so many places is that cities have personalities. A story that takes place in Seattle wouldn't happen the same way in Miami Beach. The characters, the situations, the feel of the story would all be different. For Modern Girls, New York had everything I was looking for: an immigrant community on the Lower East Side, a white-collar working atmosphere in Midtown, and a crusty upper-class on the Upper East Side. Another reason I chose New York is because it's where my own ancestors originally settled. My great-great grandparents moved to East 11th Street in New York City. In 1910, eleven of them lived in a single apartment and my great-great grandfather sold newspapers at a stand. I thought placing the story in New York was a nice way to honor my family. Originally, you went to college to study film making. What aspect of making films interested you, and how did your background in that field help (or hurt) your fiction writing? Three aspects of filmmaking intrigued me: editing, animation, and screenwriting. Unfortunately, I wasn't particularly good at film editing. Animation I loved, but the process is laborious, and I spent weeks making a single three-minute stop-motion short. When I graduated from NYU, I began working in the production department of an advertising agency, determined to write screenplays on the side. Every morning I woke up early to create the most magnificent screenplays. Only here's the thing: they weren't. Magnificent, that is. And when I showed them to people, I was told, "You have too much exposition in here for a screenplay. Pare it down." I didn't want to pare it down. That's when I realized I was more interested in writing prose. Filmmaking did give me a grounding on how to create scenes and story arcs. In my mind, my stories unfold cinematically. That said, don't ask me who would play Dottie and Rose in a movie; my favorite film stars are all from the 1930s and '40s. Fun fact: that ad agency where I worked? It was Saatchi & Saatchi, which just happens to be in the same building that houses NAL/Penguin today. What's the worst disappointment you've ever had in your writing career, and how did you get through it? Not selling my first novel. And by first novel, I mean fourth novel, but it was the first novel that I queried and it was the novel that found me my amazing agent. We worked on revising that novel, called Continuity, for over a year, but it never found a home with a publisher. Devastated doesn't begin to scratch the surface of what I felt. I questioned if I could really do it all over again, knowing that the next novel might live its life in my bottom desk drawer. But as any writer knows, writing is simply what you do. So I wrote. I wasn't ready to dive back into a novel, so I worked on shorter pieces, which are easier to publish. This gave me the ego boost I needed. I began toying with my two new characters--Dottie and Rose. Their story excited me enough that I wanted to see where I could take it, even if no one ever read it. Luckily for me, folks will be able to read it. As hard as it was not selling Continuity, it made the publication of Modern Girls that much sweeter. And I think Modern Girls is a much stronger novel. In this case, at least, things worked out for the best. If you could offer writers only three nuggets of advice that we could carry around in our pockets like lucky talismans, what would they be? Splurge on the good bourbon? Seriously, I think it's important for writers to know that writing is hard and while practice will make you a better writer, it doesn't make the act of writing any easier. Dorothy Parker put it best when she said, "I hate writing; I love having written." To that end, my advice would be: savor the rare moments when it feels good to write; write even when it hurts; and yes, splurge on the good bourbon.